In the African tradition, childbirth is considered a natural event, is viewed within a holistic context and is seen as having social, spiritual, and moral significance. 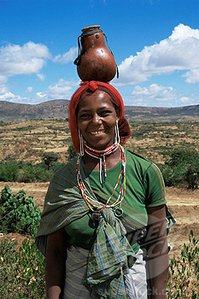 Pregnancies are likened to women carrying pots (gourds) on their heads containing water. Pregnancy is described as women who carry their earthen pots and walk to a local brook to fetch water. The pathway from the brook is considered narrow and the terrain difficult; a few fall and break their pots; some stagger but manage to keep their pots even though some water spills, and the majority of the women return home successfully with their pots and water. This metaphor of pot (gourd) is one of the ways of thinking of the womb or pregnancy. The first category represents women who experience infant loss because of miscarriages, stillbirths, or unfortunately die in the course of pregnancy or in the process of childbirth. The second group represents women who have low birth weight infants or premature births. The third group represents women who have healthy births. Because the risk for breaking the pot or spilling the water is high, the traditional practice of Ideyun (prenatal care) is used to eliminate these risks. We recognize the sacredness of birth and we use this philosophy to reclaim the traditional practice of Ideyun care for supporting women throughout their lifespan. offer other specialized consulting services. We accept insurance and direct pay for our services. Fees for our services vary according to the type of services provided.